You guys! I almost forgot to post these cookies. What am I even doing with my life?! I actually got a bunch of stuff accomplished on Sunday (hello purging and reorganizing the tupperware cabinet!) and totally spaced this post, but then after being wrecked from The Walking Dead (WUT) I crawled into bed and realized–crêpe, I forgot to get my Monday post queued up. So, downstairs I went, on went an episode of The Great British Baking Show, and here we are. I am a firm believer in the restorative powers of chocolate chip cookies. They cheer everyone up, they can turn a bad day into a better day. 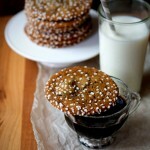 Even if the day is already a good one, a solid chocolate chip cookie can make it even brighter. I’m also a firm believer in a personal credo of mine: “there are never too many chocolate chip cookie recipes.” Yes, I have a favorite (or 3), but new iterations are always welcome. The world is your chocolate chip cookie! These almond butter babies are inspired by one of my favorite chocolate chip cookie flavors–peanut butter AND chocolate chip. I simply subbed out the peanut butter for toasty almond butter and viola! 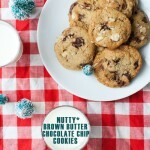 Toasty, nutty, chocolate chip cookies with chewy middles and a little sea salt crunch. 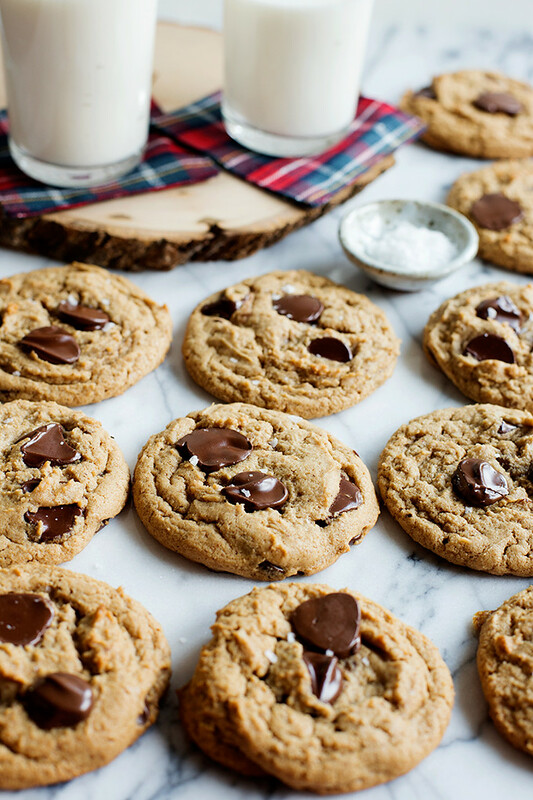 A few years ago I posted these Peanut Butter Pretzel Chocolate Chip Cookies and they are still one of my faves. 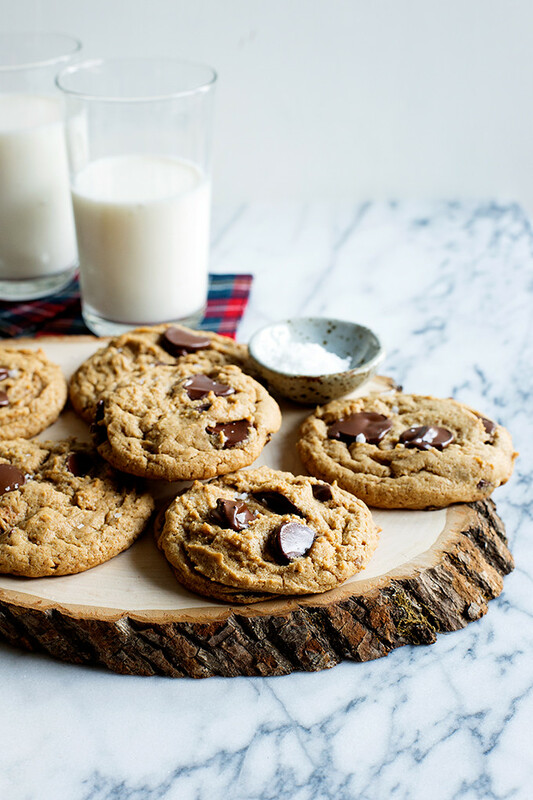 While those cookies were chock full of peanutty goodness, thick and puffy, these almond butter guys are more like the classic chocolate chip cookie with toffee-like edges and those coveted chewy middles. The key to the chew in the middle is slightly under baking these cookies. For my oven, that’s exactly 11 minutes of bake time (you’re oven is likely different, so check them after 9 or 10 minutes). I let a batch go a little over, aka, I got distracted by the internet (story of my life), and they were still okay, but lacked that awesome chewy texture. So, if you mix these up, watch the time (don’t get distracted by make-up hauls on YouTube)! Learn from my mistakes, guys. 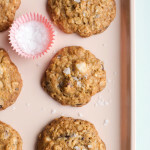 Inspired by classic peanut butter cookies, these almond butter cookies have delicious toasted almond flavor, chewy middles, plenty of chocolate chips and a sprinkle of sea salt. Preheat the oven to 350°F. Line two baking sheets with parchment paper. In a medium bowl whisk together the flour, baking powder, baking soda, and kosher salt. Set to the side. Using an electric mixer, beat the butter until creamy. Add the almond butter and brown sugar and beat until combined--don't worry about beating until "fluffy", we don't want to whip in too much air. Scrape down the bowl and add the eggs, one at a time, beating well and scraping the bowl after each addition. Beat in the vanilla. With the mixer on low, mix in the flour until just incorporated. Fold in the chocolate chips. Using a levered cookie scoop, or 2 tablespoons, scoop the dough onto the baking sheets, leaving about 2 inches between each cookie to allow for spreading. Bake the cookies for about 11 minutes, until the edges just start to brown and the centers are just underbaked. Remove from the oven and cool on the sheet for 5 minutes before transferring to a rack to cool completely. Repeat with the remaining dough. Just underbaking the cookies ensures chewy middles. I highly encourage going this route! Oh my gosh that melty chocolate!!! These look so so perfect! 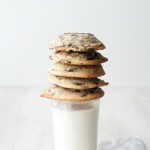 I had a huge chocolate chip cookie fail yesterday but this gives me new hope! Haha will definitely be trying it soon! Oh, no! Chocolate chip cookie fails are so sad. We don’t eat the candy that the kiddo brings home from trick-or-treat. These will be a great treat instead! Yum yum! 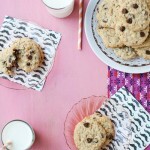 Chocolate chip cookies are most definitely a cure all! Hello, lover! 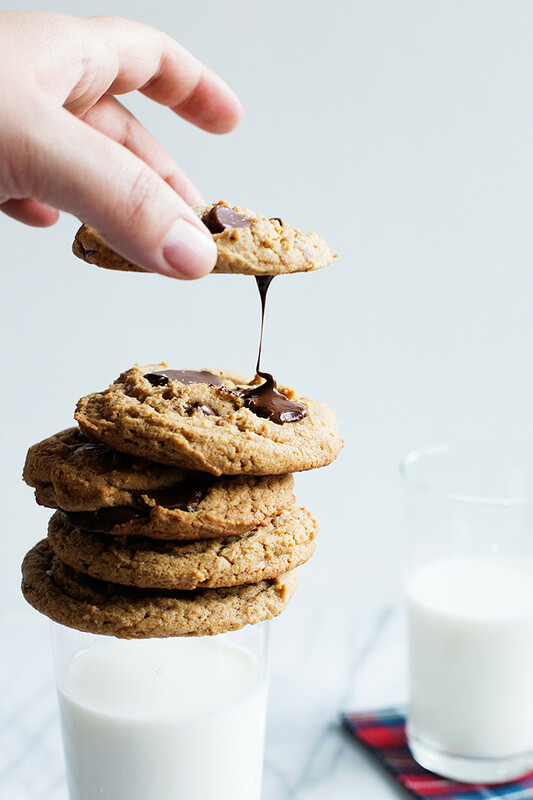 Talk about cookie perfection! You’re totally speaking my language, girlfriend. Oh these are beauts I tell ya! Gorgeous photography! 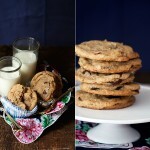 Chocolate chip cookies are totally restorative for pretty much any ailment. I could use one of these right about now — just had a burning waffle incident! You definitely need one of these, then!! But for real, I need to get these cookies and The Great British Baking Show in my life. Whoa these look so good! Salt & Chocolate make the greatest pair! I see the Almond butter in the ingredient list, but nowhere within the recipe preparation. Sorry about that, Jeff! It goes in with the sugar, I’ve corrected the recipe. Hi. Thanks for this recipe. It looks gorgeous and I’m going to make it tonight. I noticed your method makes no mention of when to add the almond butter. Should it be beaten into the butter, added alternately with the eggs, or added at the same time as the sugar? Also, I’m (genuinely, and politely :) ) wondering if you can tell me why so many awesome US food bloggers don’t include metric conversions in their recipes. The US, Liberia and Myanmar are the only countries in the world who don’t use metrics, and the US is the only country that uses ‘sticks’ of butter. Given that the internet encompasses…well, everyone, it always seemed like common sense to me that you would offer conversions…but virtually nobody does. Is it because US bloggers assume they will only attract US readers, or that you don’t realise the US is more or less alone in its use of the old system, or is it just too hard? Sorry for putting you on the spot but I’m really curious! Hi Chris, Sorry about that! I’ve corrected it. The almond butter goes in with the sugar. As for the metric conversions, I can’t speak for anyone else, but I am hesitant to offer metric conversions because I don’t want them to end up being incorrect (since I personally don’t use metric measurements). I know that it probably seems silly that the US is still not on the metric system. I’m just not confident in my conversions. 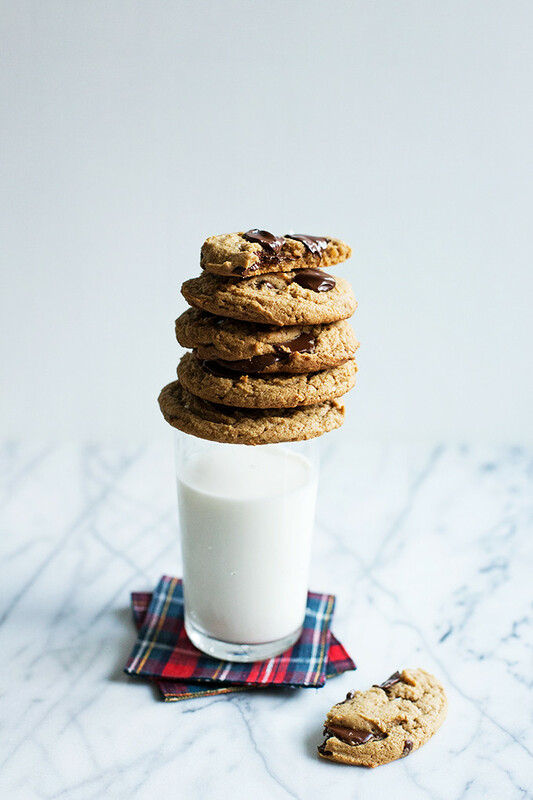 I’ve had this post open in my browser for OVER A WEEK, because I keep meaning to tell you how absolutely gorgeous these cookies (and photos!) are but, apparently, I’m a giant procrastinator. Hopefully this bodes well for the productivity of my Monday because I’m finally here(!! ), telling you THESE ARE SO SO GORGEOUS!!! Completely. Mouth. Watering. OMG YES, these sound so good, I love almond butter and just so happen to have a brand new jar which I now know exactly what I’m going to do with! Visit Cindy | Hungry Girl Por Vida's profile on Pinterest.